Over the past few years, tourism in the Philippines has been booming. Alongside the flocking of local and foreign tourists is the need for more accommodations. The good thing is, there are upcoming hotels and resorts in the Philippines that would surely make guests experience the true Filipino hospitality. #1 - NÜWA Manila: Formerly the Crown Towers, this hotel in the City of Dreams Manila is the newest luxury hotel to look forward to. The hotel is inspired by a Chinese mythology heroine which can be noticed throughout the vicinity. Operated by Melco Resorts & Entertainment Ltd., guests will definitely expect sophistication, quality, and innovation. #2 - Seda Lio: In an effort to create more Seda Hotels in the country, Ayala Land Inc. ventured into its first tourism property development in El Nido, Palawan. The three-story hotel highlighted the island's rich tropical vibe wherein every corner offers amazing views of a paradise. It sits 40 meters from the white sand beach of Lio and it also has a generous pool, a pool bar, spa villas, and kid-friendly spaces. #3 - Hilton Manila: Located in the Resorts World Manila complex, the newest addition to the Hilton Portfolio of Brands in the Philippines would surely provide a "sophisticated oasis" to its guests. Aside from its proximity to the airport and other key city destinations, it also features stylish facilities such as resort-style pool, an executive lounge, fitness center, and an ample event space. 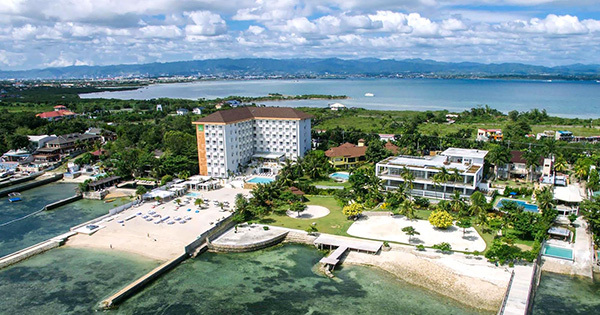 #4 - Dusit Thani Resort Mactan Cebu: In partnership with Robinsons Land Corporation, Thailand-based hospitality company Dusit Hotels & Resorts will be opening its third hotel in the country. The five-star beachfront hotel located in Mactan, Cebu will have 3 buildings with a total of 271 rooms. Leisure and business travelers alike will enjoy the luxury spa, restaurants, infinity pool, lobby lounge, and meeting spaces. #5 - Hotel Okura Manila: One of Japan's biggest hotel companies, Hotel Okura will be bringing the authentic Japanese hospitality to the Philippines for the first time. The 11-story building built inside the Resorts World Manila premises will house 191 spacious rooms, Japanese and Spanish restaurants, a bar, a pool, and fitness facilities. #6 - Sheraton Manila Hotel: Convenience, comfort, and luxury are what the new hotel managed by Starwood Hotels & Resorts Worldwide promises. It provides easy access to the airport and other key destinations. It offers comfortable and luxurious amenities such as Link@Sheriton, fitness center, spa, pool, and the Sweet Sleeper Bed in each of its 350 rooms. The 5,877 sq. ft. function hall is also great for events. #7 - One Central Hotel: A whole new experience awaits in the old Spanish quarter of Cebu City as Bluewater Hospitality opens another high-class hotel in the area. It offers exceptional services, great food, and comfortable accomodations. Combining sophistication and affordability, no doubt it will be a sure hit to every kind of traveler.